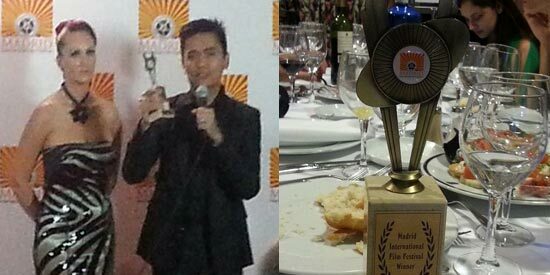 Barber's Tales director Jun Lana personally received his trophy as Best Director in the 3rd Madrid International Film Festival. Lead star Eugene Domingo attended the awards night in Spain along with Direk Jun. 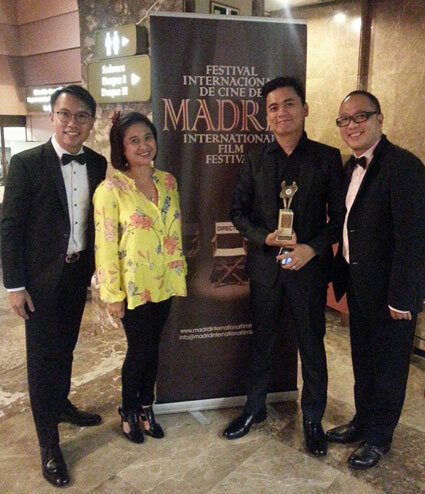 Barber's Tales has earned for Jun Lana the Best Director award at the 3rd Madrid International Film Festival. In this period film, Eugene Domingo plays a widower who takes over her late husband's barbershop at the onset of martial law (the Marcos dictatorship in the 1970s). Uge (Eugene's nickname) attended the just concluded awards night held in Spain along with Direk Jun, Ferdy Lapuz and Perci Intalan. Uge was nominated in the Best Actress category but she failed to bag the award. Also known as Mga Kuwentong Barbero, it was also nominated in the Best Foreign Feature Film Award but failed to win in this category. Ferdy Lapuz and Tony Tuviera were also nominated as Best Producer of a Feature Film but they also did not win the said category. In his speech, Direk Jun said that he shares this award with his husband Perci Intalan, producer Ferdy Lapuz, and lead actress Eugene Domingo. "Some of you have seen the film would agree with me that Eugene Domingo, the actress, is the heart and soul of the film. Eugene, this is also for you," said Direk Jun. According to Ferdy, who accompanied Eugene at the film festival held in Spain, "Happy si Uge for Direk Jun. Kasi nanalo na rin naman siya sa Tokyo last year tapos sa Udine [film festival in Italy]. Tapos yung apat from HAF." It will be recalled that Eugene earned the Best Actress plum at the 26th Tokyo International Film Festival in October 2013. In the Udine Far East Film Festival held last May in Italy, Barber's Tales landed 3rd place in the Audience Award. In the Hong Kong-Asia Film Financing Forum (HAF), the film won the Best HAF Project Award, Technicolor Award, ARRI Award, and Catapoolt Award. Aside from Eugene, Barber's Tales also stars Iza Calzado, Nicco Manalo, Nonie Buencamino, Shamaine Buencamino and Eddie Garcia. Barber's Tales is the second in a planned trilogy set in rural Philippines. This film is about a widow imprisoned by gender expectations in the 1970s. The first one, Bwakaw, featured Eddie as a grumpy aging gay who rethinks his views about death beause of his pet dog. The third installment, Ama Namin (Our Father) follows the plight of a boy who enters the seminary to be with the only family he has left: his father, who is a priest. The film is now in pre-production.